Missouri voters will be asked in November to increase the state’s gas tax by 10 cents a gallon. The Missouri House approved the proposal Friday, in the final hours of the legislative session, after the Senate had tacked it onto another bill. The increase would be phased in over 10 years, and would be used to pay for road and bridge projects, and underwrite some of the costs for the Missouri Highway Patrol. She and other backers noted that Missouri’s current fuel tax of 17-cents-a-gallon ranks 46th in the country. Gov. Eric Greitens has signaled his opposition to a gas-tax increase, but supporters are hoping he will back the idea of putting the issue to go before voters. The touchy nature of the topic was illustrated by the House vote. Although hardly anyone spoke against the proposal, the final vote was 88-60 – slightly more than the 82 votes needed to pass. Rep. Bill Reiboldt, a Republican from Neosho, was among the members of a task force that looked last year at how best to come up with the money to repair the state’s crumbling bridges and highways. Missouri has the nation’s 7th largest stretch of federal interstates, and is running short of the money needed to match federal highway aid. Under the tax-hike plan, the increase would go up in 2.5-cent intervals. When fully in place, increase is expected to raise more than $280 million a year. The bulk of that money would go for transportation projects, with about $120 million going to counties. The rest would be earmarked for the Highway Patrol, which has seen its law-enforcement responsibilities increase. Rep. Kevin Corlew, R-Kansas City, chaired the task force. He said the gas-tax increase seemed the fairest way to come up with the needed money to address, for example, the 4,000 bridges in the state that are deemed structurally unsound. Some school buses now must travel miles out of their way to avoid such bridges, he said. Aside from the gas-tax proposal, the General Assembly’s other major final-day action was to approve a partial repeal of the state’s prevailing wage law. In place for decades, the prevailing wage has required government entities to pay a specific hourly wage to workers hired for public-works projects. The rate has varied from county to county. Under the bill that now goes to the governor, the prevailing wage requirement would not apply to projects under $75,000. The measure reflects a compromise between lawmakers who wanted to do away with the prevailing wage entirely, and those who contend that such a move would prompt out-of-state companies to undercut local firms. Gov. 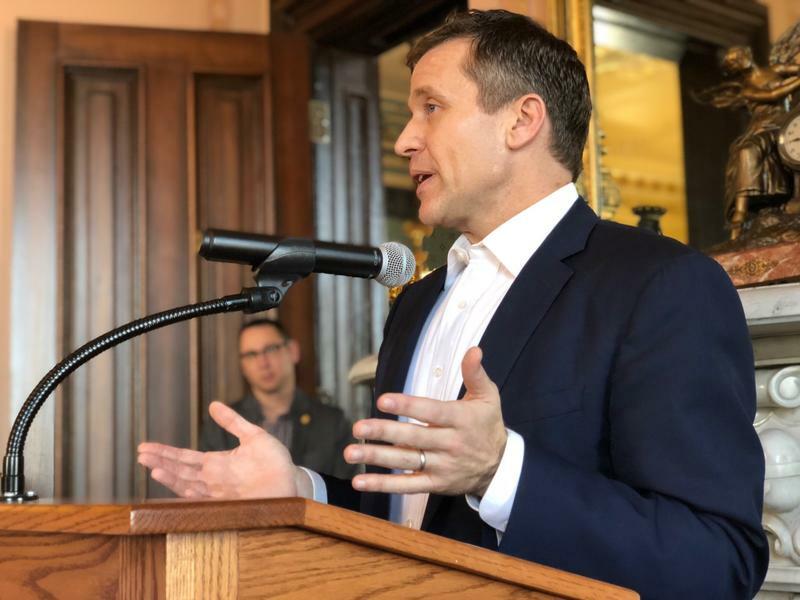 Eric Greitens reiterated Thursday that his plan to cut the state’s tax will not be paired with a fuel tax increase. The governor’s comments to members of the Missouri Press Association come as both Republicans and Democrats are getting behind the idea of raising taxes on gasoline and diesel fuel to pay for fixing the state’s roads and bridges.